The biggest of the big sailing ships to sail the promenade. You can’t see him from this angle, but there is a guy standing on the top platform behind the top most sail. Dec. 31 – Jan. 2. 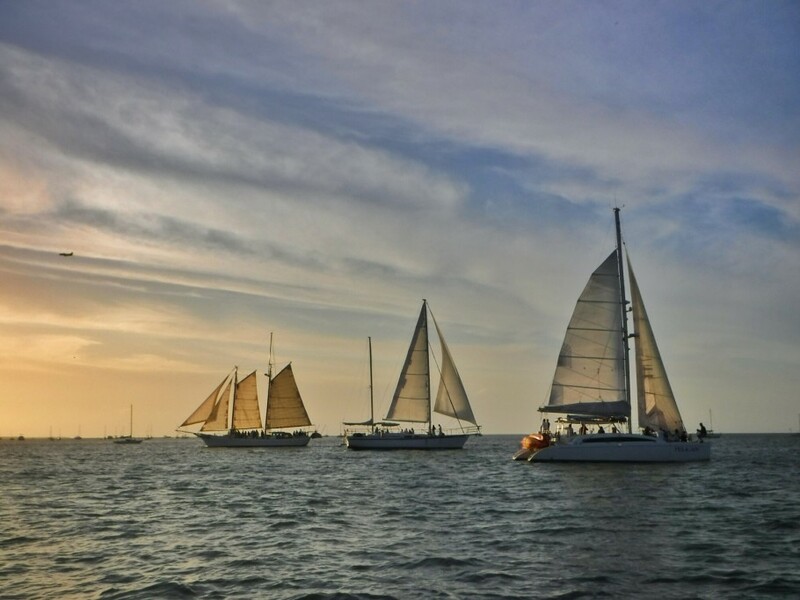 Multisailed boats parade by Blue Wing packed with tourists soaking up the sea air as the sun sinks in the sky over Key West. 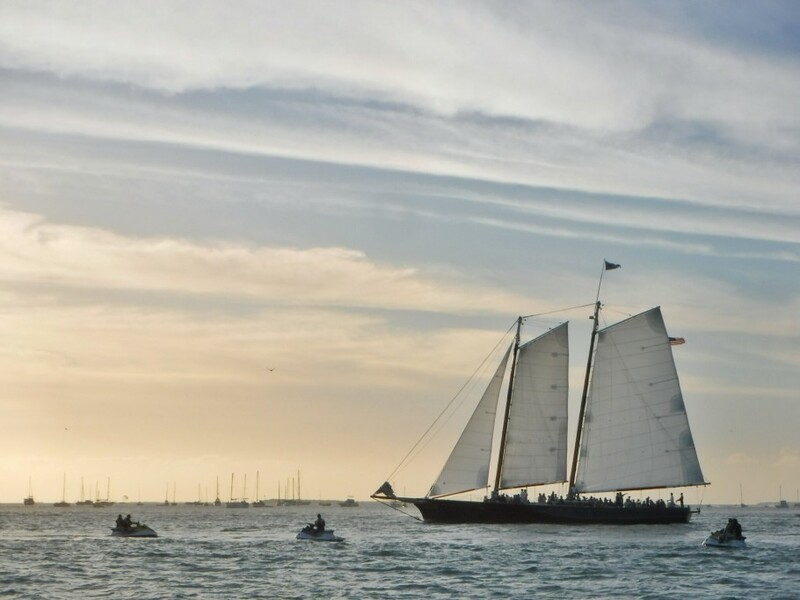 The late afternoon light turns the sails of these big boats into great luminescent sheets. One after one they sail down a promenade between anchorages before reaching shallow water, turning around and passing us once again. This is our new nightly show. After over a week at our anchorage in no-one’s-land, Greg’s foot finally recovered enough so we could move the boat to a more settled spot and easier location for getting to shore (I had not been off the boat in over two weeks). So we left the parasailers and derilict boats and found a decent piece of water off of Fleming Key and nestled ourselves between a few other boats. Later that night we saw our new anchorage’s bonus, the promenade of sailboats. We were so pleased to be in calmer waters, to have such an amazing view, and to be so much closer to town, we didn’t think it could get any better. Then new years night happened. I was in bed for a few hours when I was awakened by our dinghy, Fever, banging against the hull. I didn’t think too much about it because the current in our new location is so strong and weird stuff happens when the tide changes. And, you know, Fever gets a little antsy sometimes. While I was tightening Fev up to stop his banging, I noticed that we were pointing in a different direction from all the other boats. Of course I am all for going your own way, doing your own thing, but in a crowded anchorage, a little conformity is desirable. I watched for a couple of hours as Blue Wing moved around in all directions, dancing back and forth, here and there. Finally, I woke Greg. By the time he was up and on deck we were almost on top of another boat. Time to move! We weighed anchor and motored to another spot that seemed to have more space. Then we waited to see if Blue Wing was going to settle down into a pattern like all the other boats. We watched the chart plotter for hours as she made long oblong circles back and forth through the water. Each pass to and fro we came awfully close to a crab pot and a mooring bouy. Despite Blue Wing’s broad movements she didn’t seem to be in any danger of hitting anyone, so we went below and slept for a few hours until shortly after daybreak. In the light we could see she had finally settled down. Unfortunately this was because her anchor rode was wrapped around the crab pot and mooring bouy. Time to move again! 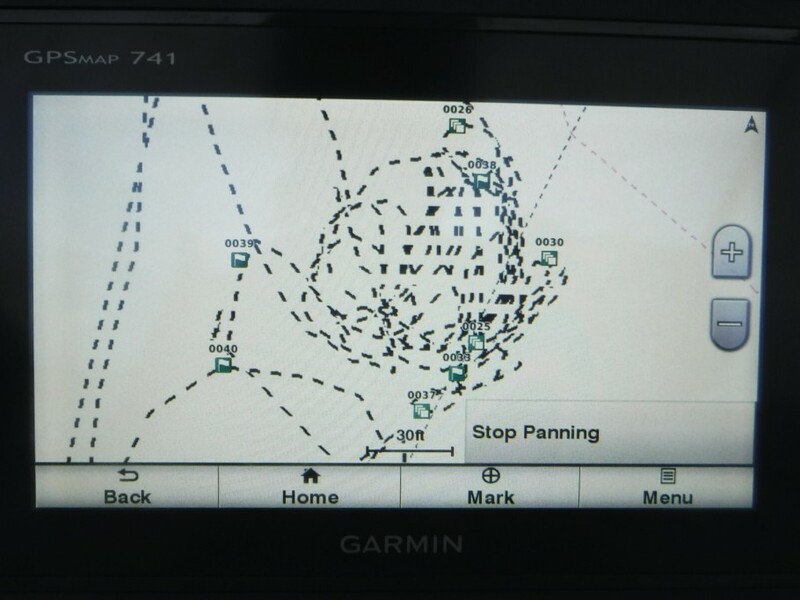 The large mess of tracks in the middle of this Chart Plotter was Blue Wing’s path as she danced through the anchorage. You can see from the scale on the chart she was traveling a good bit of distance. We got her untangled from the bouys and found another place that gave us plenty of room between ALL obstacles. 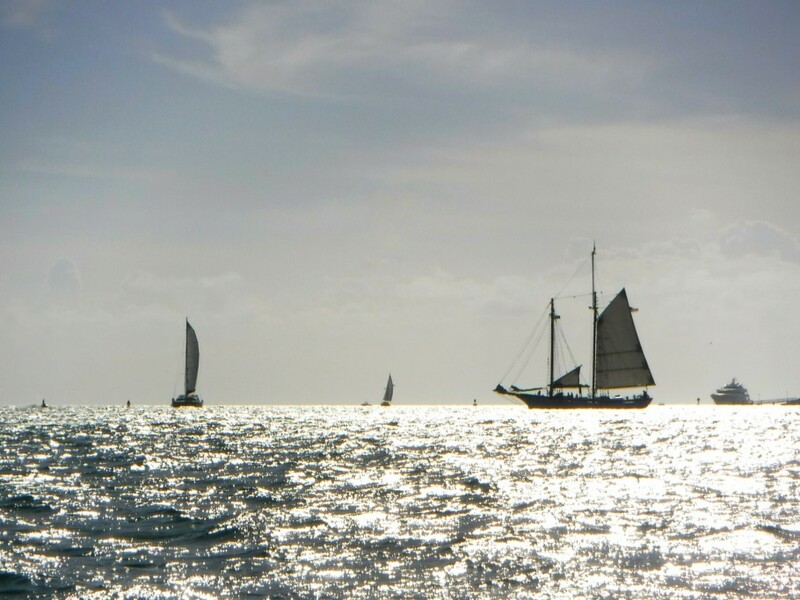 We anchored and swung back in a rhythm with all the other boats. Our new location is on the outside of the anchorage which means more jet ski wakes, but we are also closer to town and now have an unobstructed view of the nightly boat parade. Yes! It did get better, after all. Well, at least for an hour or two. Oh no! Shortly after we drop the hook another boat with a Danish flag came and tried to squeeze in between us and everyone else. We now had a changing tide with opposing wind. They were having trouble and drifted close to us. Greg let them know where our anchor was and warned them about the current. They appeared to pull up the hook and we thought they would go somewhere else, but they didn’t. Next time I came on deck the guy from the other boat had a tight grip on Blue Wing trying to keep his boat from hitting us. Their anchor chain had crossed ours and we had been pulled in the opposite direction. We worked together keeping the boats apart while he tried to pull up his anchor without pulling up ours. We finally cranked Blue Wing, gave her some reverse, and were free. They motored off passing close enough that one of their side mount solar panels barely missed hitting us, sliding through the rails of our bow pulpit! As we waited for Blue Wing to settle back in a rhythm with everyone else, we watched as the Danish boat anchored again, father from us, but too close to a different boat. Last night Fever started banging on the hull again. I got up to tighten him up and looked around the anchorage. Our Danish neighbors, who had been there at sunset, we’re now gone. 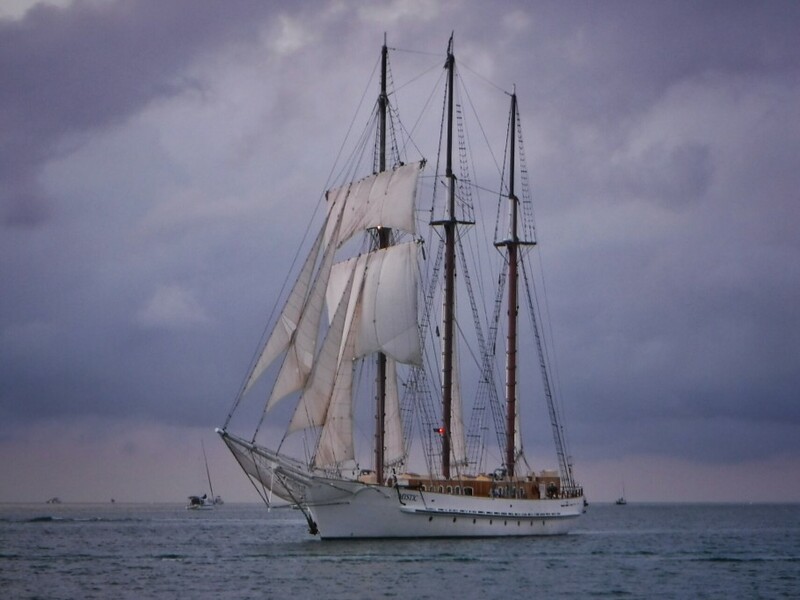 I saw long distances between us and all the other boats, so I went back to sleep feeling confident that if Blue Wing wanted to, she had all the room she needed for a little midnight dancing by herself. Greg’s foot has gotten much better. 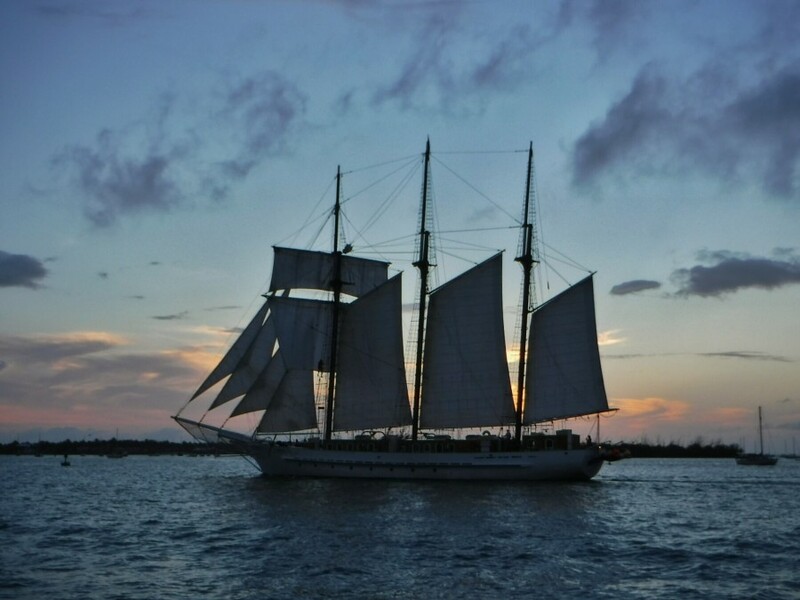 We will be here in Key West until it is 100%, or at least 99%, then wait for a weather window, then continue on our journey to Mexico. As some of you may know, our MacBook Pro broke. It is five years old and they tell me it is not worth fixing, if they can even find the parts. I have typed this post and edited these photos on my tablet. It does the job, but moving the photos from my camera to the tablet is time comsuming, editting them is harder, and uploading everthing to WordPress is a pain. But no worries, we are used to evetything being way harder than it should be and can keep the posts coming until my camera SD card fills up. What we really miss is our TV series. Will we ever find out if Captain Archer saves Earth from the Xindi?! Greg’s injury has actually ended up being a good thing. If we had continued on to Mexico, our computer would have broken there, where it may have been impossible or at least even more costly to replace. 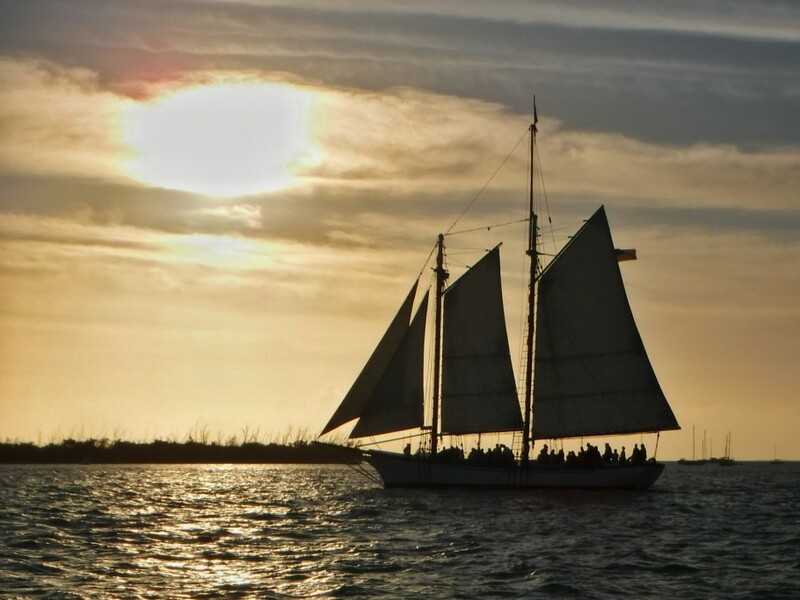 Actually, we have had even more good fortune stuck here in Key West, but we will save those stories for another post. Boats raising sails in the distance. New Years Eve was a busy night for the promenade. The sun gets ready to set. Passing in front of the setting sun. Jet skis surround the sailboat. 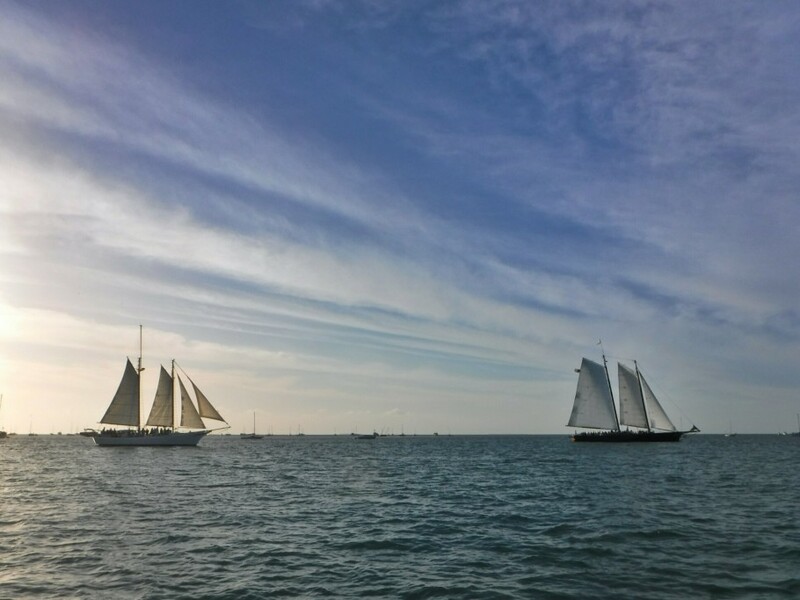 This entry was posted in Florida on the Water, Life on the Water and tagged Big boats, Key West, Sailboats. Bookmark the permalink. Thanks Terry! Lucky for us we have a wind generator. We are all powered up. Fired up the bullet this morning and made a smoothie with all the fruits and veggies we got at Publix, thanks to you! Life on the hook, nary a dull moment. 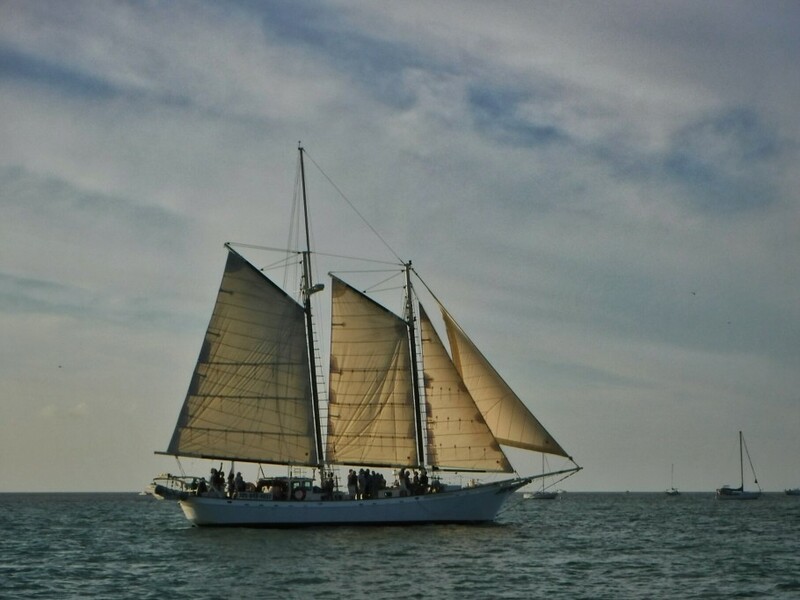 Love those schooner pics–great blog. Hope you enjoy the new computer!